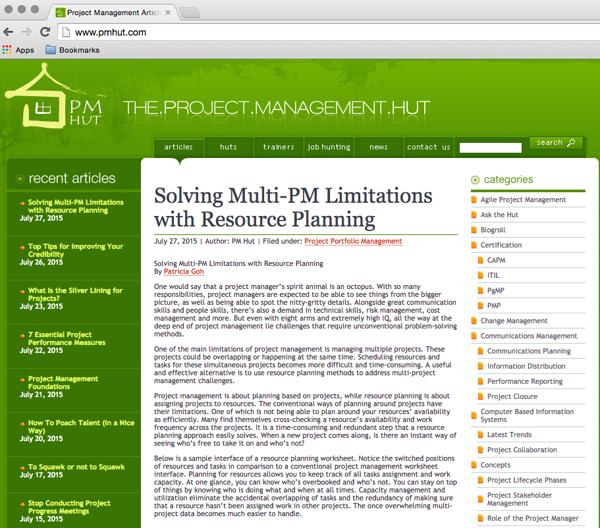 PMhut graciously published our article on solving multi-PM limitations with resource planning. It can be seen on the homepage today! One would say that a project manager’s spirit animal is an octopus. With so many responsibilities, project managers are expected to be able to see things from the bigger picture, as well as being able to spot the nitty-gritty details. Alongside great communication skills and people skills, there’s also a demand in technical skills, risk management, cost management and more. But even with eight arms and extremely high IQ, all the way at the deep end of project management lie challenges that require unconventional problem-solving methods. One of the main limitations of project management is managing multiple projects. These projects could be overlapping or happening at the same time. Scheduling resources and tasks for these simultaneous projects becomes more difficult and time-consuming. A useful and effective alternative is to use resource planning methods to address multi-project management challenges. Project management is about planning based on projects, while resource planning is about assigning projects to resources. The conventional ways of planning around projects have their limitations. One of which is not being able to plan around your resources’ availability as efficiently. Many find themselves cross-checking a resource’s availability and work frequency across the projects. It is a time-consuming and redundant step that a resource planning approach easily solves. When a new project comes along, is there an instant way of seeing who’s free to take it on and who’s not? Below is a sample interface of a resource planning worksheet. Notice the switched positions of resources and tasks in comparison to a conventional project management worksheet interface. Planning for resources allows you to keep track of all tasks assignment and work capacity. At one glance, you can know who’s overbooked and who’s not. You can stay on top of things by knowing who is doing what and when at all times. Capacity management and utilisation eliminate the accidental overlapping of tasks and the redundancy of making sure that a resource hasn’t been assigned work in other projects. The once overwhelming multi-project data becomes much easier to handle. Resource planning is known to be a component in project management. Yet it is powerful by itself to manage projects that are happening simultaneously or are overlapped. One is essentially extracting the ever-changing variables and planning around them with more educated information on availability. When project management methods and spreadsheets fail you, you now know that you can turn to resource planning as your multi-project management solution to always meeting deadlines and budgets. For more information on how Ganttic can help you in this area, sign up for your free trial to see!